What is a social economy enteprise? A social economy enterprise belongs to the community. It may be an NPO, a cooperative or a membership organization and has two main components: a commercial component (the sale of goods or services) and a social component. A social economy enterprise reinvests most of its profits in its social mission. Produced in 2013–2014, a first series of short videos entitled "Le vrai visage de l’économie sociale" highlights the benefits of purchasing from social economy enterprises. The videos aim to incite buyers to consider social economy enterprises more often. Based in Rivière-du-Loup, Broderie Signature is an adapted business in the industrial sewing sector. It employs skilled persons with significant disabilities and individuals who face major adaptation challenges in regular work environments. Broderie Signature is accredited by Emploi-Québec as an adapted enterprise. The agreement between Broderie Signature and Hydro-Québec involves the purchase of 26 000 bags for the power company’s linemen. Based in Montréal, Petites-Mains provides industrial sewing services. Each year, the business supports 60 people, especially immigrant and unemployed women and single mothers, and facilitates their social and professional integration during a 26-week program. Petites-Mains is accredited by Emploi-Québec as a social integration enterprise. Petites-Mains made t-shirts and polo shirts for the city’s firefighters. Recyclage Vanier is a Québec-based business that provides confidential document destruction and paper recycling services. Each year, Recyclage Vanier employs 40 people, especially individuals who have been outside the job market, and facilitates their social and professional integration as part of a 28-week program. Recyclage Vanier is accredited by Emploi-Québec as a social integration enterprise. Recyclage Vanier destroys confidential documents for the Centre de conservation des documents du CSPQ. The ECPAR’s project was made possible by the financial contributions of the Ministère des Affaires municipales, des Régions et de l'Occupation du territoire (MAMROT), the city of Montréal, Hydro-Québec and the ECPAR. The videos were produced by, SLA productions a social economy enterprise. 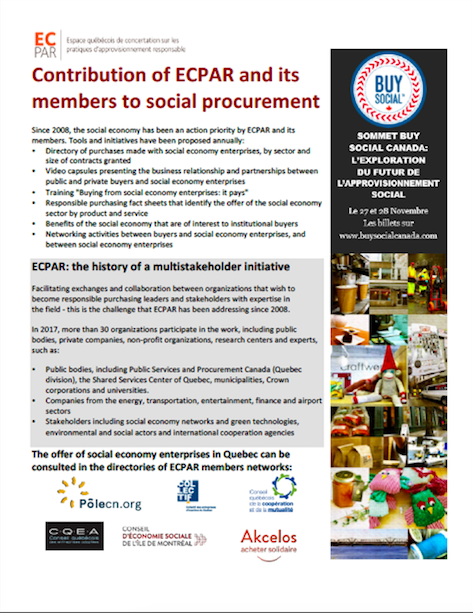 The ECPAR aims to support buyers seeking to purchase goods and services from social economy enterprises. To meet the needs of institutional purchasers, the ECPAR’s social economy committee contributed to the development of a directory of members in the social economy and cooperative movement sectors. The directory will be launched online in fall 2014 at www.achetersolidaire.com. Until then, ECPAR members have access to an internal directory . The ECPAR’s responsible purchasing information sheets on specific products and services also contain information on the sector. To purchase products and services from social economy enterprises is to indirectly support their missions and activities. Because these businesses reinvest most of their profits in their organization in order to carry out their social mission, buying from them helps to generate greater socioeconomic impacts. These impacts may be documented and integrated into accountability reports on corporate social responsibility (CSR). Information packages were developed for procurement officers in public and municipal organizations and provide practical information on ways to purchase from social economy enterprises and the potential benefits. For more information, visit the website of the ministère des Affaires municipales, des Régions et de l'Occupation du territoire (MAMROT), which coordinates the government’s interventions in the social economy (in French). In 2006, Hydro-Québec collaborated with the Centre de formation en entreprise et récupération (CFER) in Victoriaville to recover and transform seven power poles. The CFERs also recover and refurbish used clothing. Since 2009, the city of Montréal has worked to support the social economy on its territory and released a document on the topic entitled Partenariat en économie sociale pour un développement solidaire et durable. In its 2011 procurement policy, the city affirmed its willingness to increase the participation of social economy enterprises in municipal procurement and reiterated its commitment by signing the Déclaration d’engagement à l’achat public auprès des entreprises collectives in 2013.